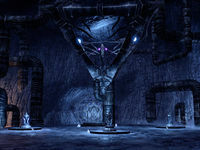 Prevent the Daedra from using Galerion's essence to power the Planemeld. The Black Forge — Enter the Black Forge and rescue Vanus Galerion. I came across a magical recording of Vanus Galerion. The message says that the mage decided to enter the Black Forge on his own. He plans to reach the Great Shackle and destroy it, thus completing our mission in Coldharbour. Talk to the Projection of Vanus Galerion. Defeat Kothutuilk and find Galerion's body. I should enter the Black Forge and try to find Vanus Galerion. The message suggested I go in through the side door. Inside the Black Forge, I found Vanus Galerion. At least, I found a part of the Great Mage. I should talk to the essence of the mage. Vanus divided himself into three fragments so that the Daedra couldn't use him to power the Great Shackle. To free the first fragment, Galerion's Health, I need to kill vampires and recover his stolen health. I freed the mage's essence of health. Now I need to go to the slave quarters and find the essence of stamina. I made my way to the slave quarters. Now I should find Galerion's essence and see what it has to say. To free Galerion's stamina, I need to recover the energy that was stolen and fed to the slaves. I can either convince the slaves to willingly return the energy, or I can use the Taskmaster's device to destroy them. I recovered the energy taken from Galerion's stamina. I should talk to the mage's essence and return the energy. The last fragment of Vanus Galerion's essences is trapped in the Foundry. I need to go there and free the essence of magicka. I made my way to the Foundry. Now I should find Galerion's essence and see what it has to say. Galerion's magicka essence is being used to power the Foundry. I need to unlock the four seals of binding containing the magic that holds him in place. I released the seals that contained the magic holding Galerion's essence. I should talk to the mage's essence and see if it can break free. Now that I've collected all of Vanus' essences, I need to find the body of the Great Mage. Vanus Galerion's body is held in some sort of Daedric cage. I need to place his essences in the Daedric conduits to release him from the cage. Vanus Galerion has been restored and made whole. He wants me to follow him into the Great Shackle. Vanus Galerion has been restored and has led me to the Great Shackle. I should speak to him and see what he thinks we need to do next. This page was last modified on 8 August 2018, at 17:29.